We're excited to be returning for another year at the Sheraton Portland Airport Hotel as our events and convention space for Furlandia 1967: The Summer of Fluff! Situated on airport grounds a short ride from Portland International Airport (PDX), the Sheraton Portland Airport Hotel is easy to get to for both locals and visitors alike thanks to a 24-hour complimentary shuttle service to PDX and its TriMet light rail connection. Those driving will enjoy the free parking at the hotel, as well as the close proximity of the hotel to Interstate 205. Free Wi-Fi in guest rooms and event/common spaces. Shuttle to Cascade Station Shopping Center stores and restaurants. On-site Fitness Center and Sauna. Gift shop located in hotel lobby. Columbia Bar and Grill located in hotel lobby. Of course, the hotel staff also love fuzzbutts like us, which makes it the perfect place to stay for the convention. As well as being right where all the action is happening, staying at the Sheraton Portland Airport Hotel means you won't have to worry about driving anywhere, making it a far more relaxing convention experience. Our specially-negotiated convention rates (see below) also help you save money and help us keep the hotel happy. Those with four-legged friends will be pleased to know the Sheraton Portland Airport Hotel is dog-friendly, with dogs under 40 pounds welcome at the hotel for no extra fee. For the safety and comfort of other residents, guests with pets must stay in first-floor rooms. There is even a special pet-friendly area outside to take the call of nature! However, guests are responsible for cleaning up after their pets both inside and outside of the hotel, as well as covering any damages caused by their pet during their stay. Pets over 40 pounds may be accepted at the hotel's discretion, but the hotel asks you to contact them at (503) 281-2500 ahead of your stay to discuss your needs. Like any convention, the way our attendees treat the hotel reflects the convention itself. And that means if our attendees don't respect the hotel, we won't be welcomed back. To ensure that doesn't happen, we ask that all guests use some basic common sense during their stay at the hotel and treat all staff, guests, and convention attendees with respect and dignity, as well as ensuring that all hotel and convention property is treated with an equal amount of respect. Be courteous to housekeeping, clean up after yourself, and remember to tip! Treat the hotel and its staff with respect. Do not break anything or cause damage to hotel property. Obey the hotel's no-smoking and no-vaping policy. Smoke only in designated outside areas, which are clearly marked. If you smoke in or damage your room, you'll be charged for it. Do not bring illegal substances or engage in illegal activities on hotel grounds or in convention space. Do not bring weapons of any kind onto hotel grounds or into convention space. Simply put, we're asking you to follow standard hotel rules. Here at Furlandia, we view these rules as mandatory, not optional. If you're removed from the property or you violate hotel rules, you'll lose your convention membership. 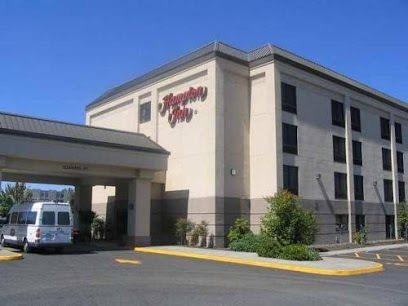 Situated on airport grounds a short ride from the Portland International Airport (PDX), the Hampton Inn Portland-Airport is adjacent to the Sheraton Portland Airport, making it a short walk from our main convention space. Like our main hotel, there's a 24-hour complimentary shuttle service to PDX and its TriMet light rail connection, and also benefits from the same close proximity to Interstate 205. Staying at the Hampton Inn Portland-Airport means you'll be right next door to all the action, so you won't need to drive anywhere, or even walk very far. Our specially-negotated room rates also help you save money. The Hampton Inn Portland-Airport cannot accept pets. However, registered service animals are welcome. Note: Aloft Portland Airport at Cascade Station does not have a web booking option at this time. Call (503) 200-5678 and ask for the Furlandia room block to book a room. Situated on a short ride from Portland International Airport (PDX), the Aloft Portland Airport at Cascade Station is situated at Cascade Station, a short ride by complimentary shuttle bus from our main convention space at the Sheraton Portland Airport Hotel. Like our main hotel, there's a 24-hour complimentary shuttle service to PDX and its TriMet light rail connection, and of course, benefits from the same close proximity to Interstate 205. 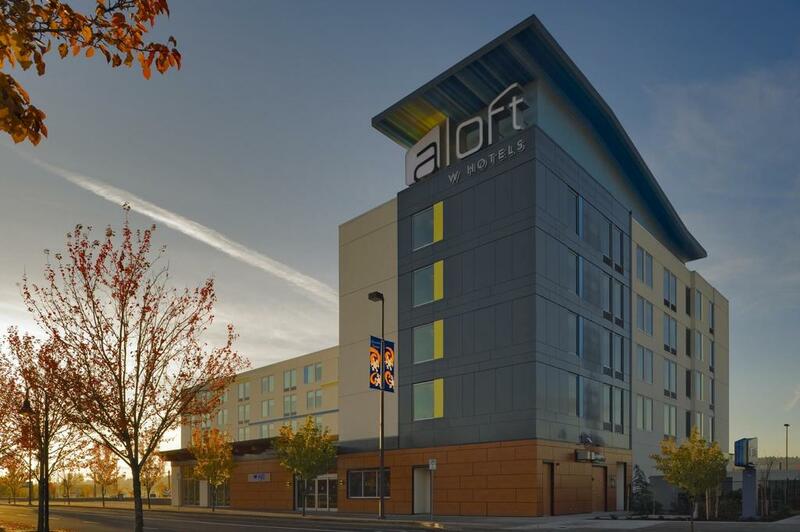 Staying at the Aloft Portland Airport at Cascade Station means you are a short ride from where all the action is happening, so you don't have to drive anywhere or even walk that far—and the complimentary bus ride to our main hotel runs frequently too, so you won't miss out on the fun! Our specially-negotiated convention rates (see below) also help you save money. Those with four-legged friends will be pleased to know the Aloft Portland Airport at Cascade Station is dog-friendly, with dogs under 40 pounds welcome to stay at the hotel for free. Guests are of course responsible for clearing up after their pets both inside and outside of the hotel, as well as covering any damages caused by their pet during their stay. Pets over 40 pounds may be accepted at the hotel’s discretion, but the hotel asks you to contact them at (503) 200-5678 ahead of your stay to discuss your needs.